This tutorial provides you with a foundation for working with vector in Adobe Photoshop. It is the first lesson in the Adobe Photoshop CS6 Digital Classroom book. For more Adobe Photoshop training options, visit AGI’s Photoshop Classes. In this lesson, you have the opportunity to learn about some of the new features in Photoshop CS6 by putting together an exciting composition. Users of all levels can follow this step-by-step exercise of new features in Photoshop CS6. However, if you are a new user, we recommend that you start with Lesson 2, “Getting to Know the Workspace,” and return to this lesson when you have completed all the other lessons. Register your book at www.digitalclassroombooks.com/CS6/Photoshop to gain access to updated lesson files on any computer or watch the videos on any device. You will work with several files from the ps01lessons folder in this lesson. Make sure that you have loaded the pslessons folder onto your hard drive from the supplied DVD. See “Loading lesson files” in the Starting up section of this book. Now, let’s take a look at some of the new features in Photoshop CS6. In this lesson, you’ll create a photocomposition that will come from several sources, allowing you to use some of the new tools and features available in Adobe Photoshop CS6. 1 Choose File > Browse in Bridge. You will use Adobe Bridge to locate your images for this lesson. Adobe Bridge also helps you to search for, organize, and manage your documents. 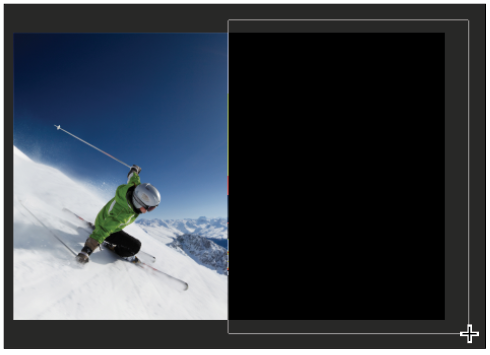 Refer to Lesson 3, “Taking Advantage of Adobe Bridge,” to find out more about Adobe Bridge. 2 In Bridge, choose Window > Workspace > Essentials to make sure that you are viewing the entire workspace. If you are unfamiliar with Adobe Bridge, click the Folders tab in the upper-left corner of the workspace to navigate from one folder to another. If you saved your lesson files on the desktop, click Desktop; all the folders on your desktop appear in the Content panel. 3 Navigate to the ps01lessons folder and double-click to open the file called ps0101_done.psd. An image of a skier appears. In addition to some standard Photoshop features, some need-to-know new features have been integrated into this lesson. As you can see by investigating the Layers panel for this image, many of the new features in this lesson relate to new and exciting vector capabilities. 4 Now that you have seen the final image, choose File > Close. If a Warning dialog box appears, click No (Windows) or Don’t Save (Mac OS). In this part of the lesson, you will learn to append custom vector shapes, apply a pattern to them, and adjust the stroke and fill. 1 Choose File > Browse in Bridge. If you do not already have the contents of the ps01lessons folder open, click the Favorites tab in the upper-left of the Bridge workspace, and then choose Desktop. Locate the ps01lessons that you copied from your DVD to the Desktop. 2 Open the ps01lessons folder and double-click to open the ps0101.psd file. 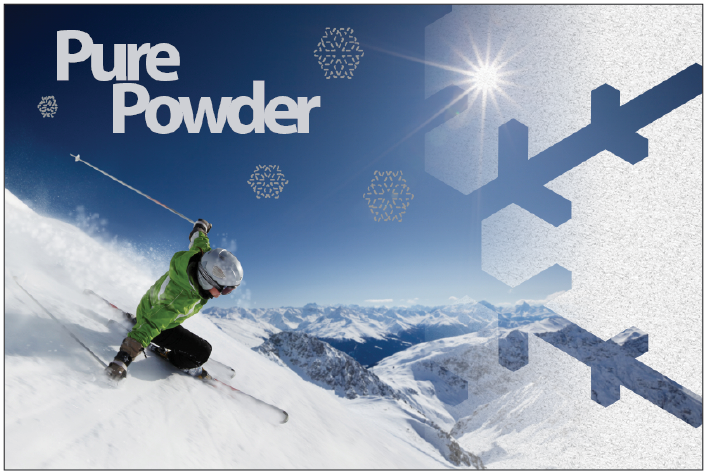 An image of a skier appears. 3 Choose File > Save As to open the Save As dialog box. Using the Save In drop-down menu, navigate to the ps01lessons folder. Type ps0101_work in the File Name text field and choose Photoshop from the Format drop-down menu. Then click Save. If the Photoshop Format Options dialog box appears, click OK.
4 Select the Rectangle tool ( ) located directly above the Hand tool in the Tools panel, and then click and drag to create a large rectangle that covers the right half of the image. When you release the mouse, notice that a Rectangle 1 vector layer has been added in the Layers panel. You will now fill this rectangle with a pattern by taking advantage of some of the new vector features that have been added to Photoshop CS6.